Yup - that's a pile of nice, brand-spankin'-new 1x3s. They were hidden behind the plywood & cardboard under the Old Saybrook section of the layout. And I had literally just cut open the (now-extra) bundle I bought just about 30 minutes before discovering this pile. So I guess the take-away is to try and keep better track of my materials. Not hiding them behind other things would be a great start. But no worries - I figured I knew all there was to know about motive power use during my era. And it's true - no RS-1s were used on the Valley Line (or the Air Line either, for that matter) in 1947. But a quick review of the railroad's Engine Assignment Book for April 24, 1949 shows an RS-1 being used on PDX-1 (the Cedar Hill - New London Shoreline Local) the #0669. Worse Even better, Atlas produced the #0669 in that beautiful delivery scheme. What followed was a frantic search on the internets for the now-out-of-production Atlas NHRR #0669. Good news! I found one - for a steeply discounted price! - at TrainWorld and I immediately ordered it. Bad news: Randy was sure - despite what was on TrainWorld's website - that they were actually out of stock. Turned out, Randy was right. TrainWorld called me a few days later (WTH?!) to tell me they no longer had the #0669. Ah well - "it's not really in my era anyway" I consoled myself. Which is about when Randy stepped in with news that he'd found an 0669 in a local shop. Not quite as discounted, but very much available. Well, it's not available any more, since I got it. So it looks like I've started down the path of modeling a date range rather than a particular year. It'll still always be October, but during operations you'll know what year it is depending on the motive power that shows up - from fully steam (1947), to a mix of steam and diesel (1948), to fully diesel (1949). That, coincidentally, is a pretty interesting - and very fast - transition: Certainly compelling enough for me to allow just a little bit of era creep and - bonus! - it should also provide some neat variety for my crews to keep them coming back for more. P.S. while I have great detail on the actual locomotives used in 1948 and 1949, I don't have the same level of detail for my primary year - 1947 - since I don't have an Engine Assignment book from that year. So if you have - or know where I can get - a copy (even a photocopy) please let me know - thanks! As you can probably tell from my recent posts, I enjoy building benchwork. It's great to get down in the basement with my saws & drills and have some nice tangible progress to show for the time I spend. Ironically, if I do it right, it'll eventually "disappear," doing its job of supporting the layout unobtrusively and without any fuss. I copied this from "Basic Model Railroad Benchwork" (2002 ed) and laminated it with clear packing tape. I use it that often. It gives you a nice, quick reference to all the dimensions you'll need to keep in mind - maximum spreads & overhangs, sagging minimums, etc. I don't have it memorized yet, but until I do I keep it handy in my shirt pocket. So once I got some more of the right lumber (still can't believe I ran out), I could finish building the L-girders, splice them together, and start building the legs. The maximum L-girder length (at least the maximum you'll want to handle) is 8', corresponding to the typical length of lumber. But your benchwork probably has sections far exceeding that length. 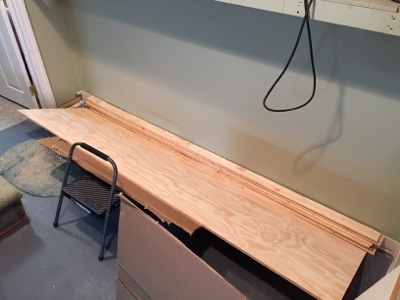 In my case, my peninsula is just over 14' long., so I needed to splice L-girders together. Here's how I do it: I clamp a 4' level - 2 clamps on each side of the joint - to insure that the girders are straight with each other. Then I screw a plywood splice on the back (non-flange) side. The recommended minimum length of the splice is 4x the width of the web. In my case, the web is a 1x3 so my splice is 12" long. Once that's done, I splice the other/flange side with thinner plywood or masonite. Anything thicker will prevent you from inserting screws through the bottom of the flange and into your joists. Next, I turned my attention to the legs. One of the things I always thought was overkill was using these T-nut adjusters, but I quickly changed my mind once I realized how easy height adjustments can be (no shims, and they allow the legs to go down without cutting!). They also keep the bottom of the leg from wicking up any moisture from the floor. They're cheap and easy to install - just make sure you drill the hole deep enough to accommodate whatever length of bolt you're using. I thought I'd taken a picture of how I clamp/jig up the legs, but the process is pretty straightforward. You want the legs to be parallel with each other and at a perfect right angle to the crosspiece. That crosspiece will double as a joist later. I use a carpenters square clamped to the leg to help me set the joist at the right angle, then clamp the joist to the leg for screwing in. Repeat for the other side. How far apart should the legs be? There are a few variables to keep in mind, but I think the most important is the "maximum overhang" measurement of the joists you're using. Referring to my handy card, I see that 1x3 joists can overhang a maximum of 18" and the maximum distance between the legs is the "support spread maximum" - 4'6". So, putting legs anywhere on that joist no farther apart than 4 1/2 feet and no further away from the end of the joist than 18" will be fine. So LOTS of latitude here. In my case, I decided to put legs right in the middle of the widest part of the benchwork - the turnback loop at the end of the peninsula. The curve's radius there is 24" (remember, it's a freight-only branchline) so a 5' joist would support the loop and provide about 6" of scenery on the outside of the track (though I'll probably cut that back at some point to make my aisle wider. See? VERY adjustable). 5' joist - measure 18" in from each end - puts the legs at 2' apart. Just fine. Once the crosspiece/joist is attached to the legs, I use 1x2s for the crossbraces. 4' long gives me two braces from a piece of lumber. Just remember to prevent the braces from interfering with where the L-girder will go. I forgot in the photo above - I'll have to cut off that little corner that goes past the leg. Making legs for the other end of the peninsula L-girders was easy. There aren't any. Instead, I just used scrap 1x3s to attach them to the 2x4 I'd installed on the wall earlier. 1x2s would do just as well, but even scrap 1x2s can be useful as risers for your subroadbed, so it's best to save them for later. I've placed 2 levels - 4' one across both L-girders to confirm joists will be level & small torpedo level to confirm flanges are level and will snug up to the joists properly. Turning the little bolt feet (technical term) on the bottom of the legs will help level things up. Here's a closer view of the giant plywood turnback loop template, with the plumb bob showing it's placed perfectly. Incidentally, the excess overhang of the L-girders will definitely be cut back to provide more aisle space here. Overview of where things presently stand, literally. This view is as you come into the room - Essex will be in the foreground & Deep River will be on the other side (there'll be a backdrop down the center). And this is looking back toward the door - an admittedly rare view, though you can clearly see the Shoreline turnback loop benchwork in the far background, and the Somerset module to the right of that. So that's where things currently stand. Considering how easy this benchwork is to build, I'm a little surprised that I'm not further along. But I have to remind myself that I'm only spending a couple hours at a time on it (I could probably do it all in the course of a FULL 2-day weekend, but who has those anymore? ), and there is a fair amount of thinking/planning that you have to do before cutting lumber and screwing it together. If "measure twice, cut once" is good advice, I'll add "think it through, THEN measure twice, cut once." Thankfully, there's only one minimally complicated area to address in this room (I'm not counting the liftout between the Saybrook wye and the wall), and then I can make with the joists. That process goes VERY quickly and will not only show you just how it's all going to look in the room, but will give me a base to start actual track planning! But before you can build benchwork, you need to have at least some idea of what you need. And before you really know what you need, you need to plan your aisles. Trackplanning is very popular and for good reason - it's always great to dream. But once you have your dream plan, you need to get a good dose of reality. People have to run those trains and you have to have enough room for them. So what follows is my process for figuring out aisles. Maybe you'll find a useful tip or two. My first step, after having a rough idea of where I need the railroad to go, is to start mocking it up on the floor. This way you'll start seeing it in relation to what you already have in place, whether it's walls, or support posts, or - as in my case - preexisting sections of layout and benchwork. You'll see in the pic above one of the existing modules (upper left corner) and the benchwork that will support East Haddam (upper right corner). The yellow tape is measuring the distance from the wall to (roughly) the edge of the module. That's my maximum L-girder length for the peninsula which will support Essex (near you & the doorway) and Deep River (which will be on the other side of a central backdrop, across the aisle from East Haddam). The stick on the floor roughs in where the front edge of the Essex side of the peninsula will be. If you "embiggen" the photo (you can always click on a photo to make it larger), you'll see my handy-dandy plumb bob just above that white curve on the floor. Once I knew where the front of the Essex benchwork could be, it became obvious that I'd have a short choke point between it and the blob that represents "points west" on the Shoreline section of the layout. After operating the "north end" of the Valley line for a while now, I know that the choke point that exists between the Middletown blob and the Rocky Hill blob (22") isn't a problem since there's LOTS of space on either side of that point. So I figured 24" here between the Shoreline blob and Essex would be acceptable as well. So, when you enter the room, you have ample (4 plus feet) of width before you get to the choke point, and after that - when you're in front of the Somerset module - the space goes back out to 3 feet or so. The next potential choke point would be between the Mill Hollow module and the end of the Essex/Deep River blob/peninsula. I again used my plumb bob (it's hanging from the green clamp on the left) to help me mark on the floor where the front of the module's fascia is. A large T-square made marking the parallel line (representing the end of the blob) easy, but you can certainly get by without it. At first, I figured that I'd go down to 24" again - but after (lots of) additional thought, I decided on 30" because: 1) the width of the blob would make any resulting choke point that much longer, 2) there'd often be operators at Mill Hollow and having the blob fascia practically hitting one's back would make things feel cramped, and 3) 30" is about the width of a standard door - so should feel comfortable, or at least familiar to folks (and 36" would shorten Essex and Deep River too much). The next choke point would be the "inside" of the blob - the 180 degree curve between East Haddam and Deep River. You can see that curve mocked up on the floor above. East Haddam will be along the wall to your left, Deep River will be roughly to the left of the yellow tape and on the opposite side of the aisle from East Haddam. You can see the doorway and the "Essex fascia stick" at the right. Standing on the inside of a 24" radius curve would definitely be snug, so I'm planning for the Deep River end of that curve to flare out a bit to make the aisle wider. Hmmm.... guess we'll have to see after a few ops sessions. There's not a lot of wiggle room - things gotta go where they have to go - but one of the many benefits of L-girder benchwork is that the aisle width is easily adjusted. So I'll see if I can widen the aisle here a bit, even if I have to sacrifice some foreground scenery in East Haddam and Deep River to do so. My final step was to rough in the end of the peninsula a bit more and check clearances on each side of it, and I'd already determined its limit toward the Mill Hollow module. Boy, that plumb bob is hard to see in the pic above, but it's hanging from the level, 24" from the end of the joist there on the right. Again, the cardstock curve shows where the edge of the fascia would be and the plywood shows me where the track subroadbed will go. Fortunately, there's "plenty" of room on the left side of the blob (relatively speaking), so no need to figure a choke point there. This is one of the funner parts of all this roughing in - seeing some "track" down on the floor - in this case, chalk lines showing where the subroadbed will go (bonus: just erase mistakes with a damp cloth, as I've done here). And heres - again, roughly - is where the end of the peninsula will go, having taken into account aisle widths on all three sides. All this takes some time and some thoughtful work, but once you have your aisles figured you know the rough footprint of where your benchwork will go. And once you know that, you know much better how much material you need and what exactly you need to build (how many L-girders, how many legs, how many joists & what length). Remember: L-girder benchwork makes it easy to adjust things as you go - or even at some future time. It's just important to get a good sense of where your aisles will go and to know where your choke points will be. Planning the aisles first not only prioritizes the people that'll be operating your railroad, it also is the critical first step to building your benchwork. After all this though, I couldn't resist putting some real, actual track on the wye benchwork. Before finalizing the position of that benchwork section, I just wanted to confirm that the track could go where planned. Thankfully, it does. Whew! Bonus: I can really start to see this area coming together - sure adds a great jolt of motivation to keep going!